In an expansion of its retail grocery business, food distributor SpartanNash Co. plans to acquire Indiana chain Martin’s Super Markets Inc.
Financial terms of the deal, announced Tuesday, weren’t disclosed. A wholesale customer of SpartanNash, Martin’s operates 21 stores, including 18 in northern Indiana and three in southwestern Michigan. The South Bend, Ind.-based retailer totaled more than $450 million in sales for its fiscal year ended July 29. SpartanNash said the addition of Martin’s enlarges the eight-state Midwestern footprint of its corporate-owned retail stores. The Grand Rapids, Mich.-based company currently operates 139 supermarkets, mainly under the Family Fare Supermarkets, VG’s Food and Pharmacy, D&W Fresh Markets, Sun Mart and Family Fresh Market banners. Those locations also include 83 pharmacies and 29 fuel centers. The transaction is expected to close early in SpartanNash’s fiscal 2019 first quarter, pending customary closing conditions, the company said. Founded in 1947, Martin’s has stores in the areas of South Bend, Mishawaka, Granger, Elkhart, Goshen, Plymouth, Nappanee, Logansport and Warsaw, Ind., and in Niles, Stevensville and St. Joseph, Mich. The company also operates 17 in-store pharmacies, a pharmacy at the St. Joseph Health System in Mishawaka, a Martin’s Express convenience store in South Bend and a Side Door Café at Elkhart General Hospital. 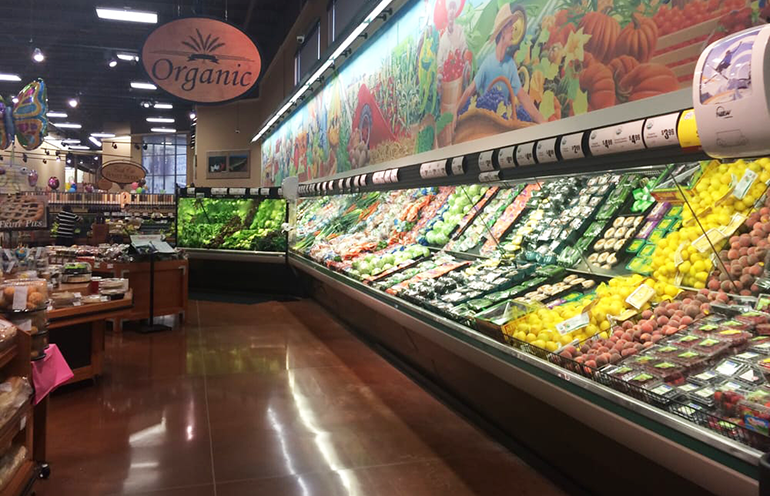 Martin's organic produce selection fits SpartanNash's focus on natural foods. SpartanNash has been working to re-energize its retail grocery stores, which are positioned as neighborhood markets to differentiate them from supercenters and limited-assortment supermarkets. Remodels have focused on enhancing the shopper experience, such as through expanded fresh, prepared and natural/organic foods; fast checkout lanes; and specialty stations such as Fresh Divide (where produce can chopped, diced or sliced on request), Betty Kaye’s Smokehouse (offering smoked meat prepared by pit masters and paired with special-recipe rubs, sauces and hot sides) and Donut Dohjo (offering gourmet doughnuts made fresh daily). The company also continues to roll out its Fast Lane click-and-collect service across its stores and has launched online grocery delivery with Instacart at select locations. Earlier this month, SpartanNash reported that retail segment sales fell 3.7% to $446.3 million for its third quarter ended Oct. 6. The company attributed the decrease primarily to $15.1 million in lost revenue from the closing and sale of stores and a 1.9% dip in same-store sales (excluding fuel). Under the retail repositioning program, SpartanNash completed three store remodels in the third quarter and two early in the fourth quarter. “We remain excited about our brand positioning and the resulting improvement in sales and customer satisfaction and will continue to roll it out to additional markets,” Staples told analysts in a conference call on third-quarter results. In reporting the quarterly results, SpartanNash said it had retained Harvest Earnings, a third-party advisory firm, to help “transform our culture” to engage employees at all levels and field ideas on how to operate more efficiently and better serve customers to boost sales and profits. The quarter’s end also saw a leadership change for the retail grocery business as Ted Adornato, executive vice president and general manager of corporate retail, retired effective Oct. 6 and was succeeded by Tom Swanson, who holds the title of senior vice president and general manager of corporate retail. Adornato had overseen the retail unit since 2003.